We realized beforehand that discovery of fall color in Oregon in mid-October was dicey at best, but we saddled up anyway. 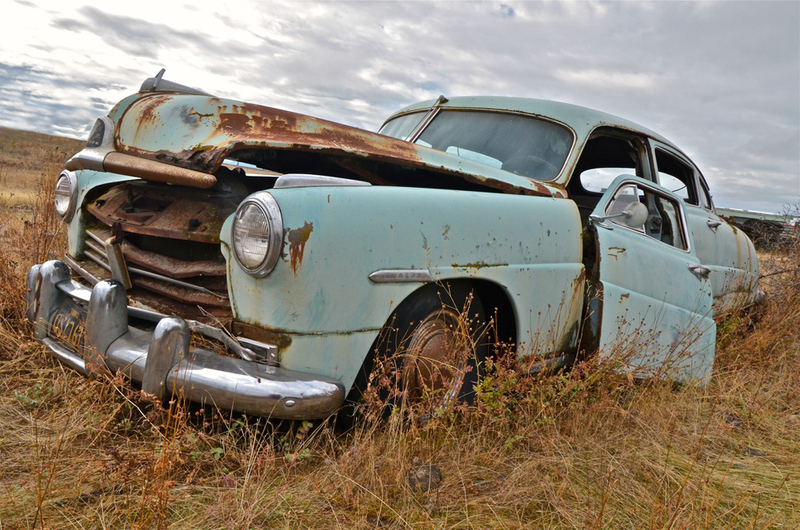 It was the only time Pat could take time off from work, and we were pretty well assured that alluring foliage or no, other objects – namely, old barns, old cars, old trucks – not dependent on the vagaries of Mother Nature would be there to capture … assuming that we could find them. Moreover, we figured that even if worst-case scenario prevailed, it would be an enjoyable drive, a chance for the two of us to get away at a time when kids are back in school and highways and byways are less traveled. There was added inducement as well. 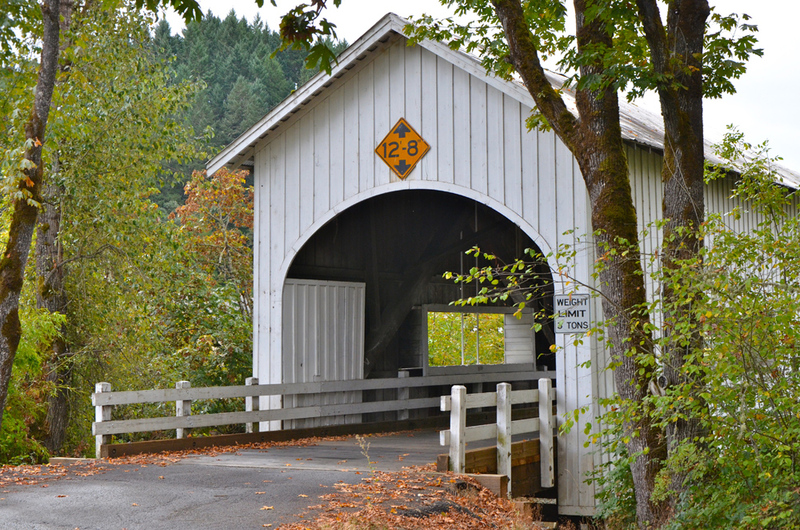 Research indicated that within the state’s borders there were covered bridges galore. 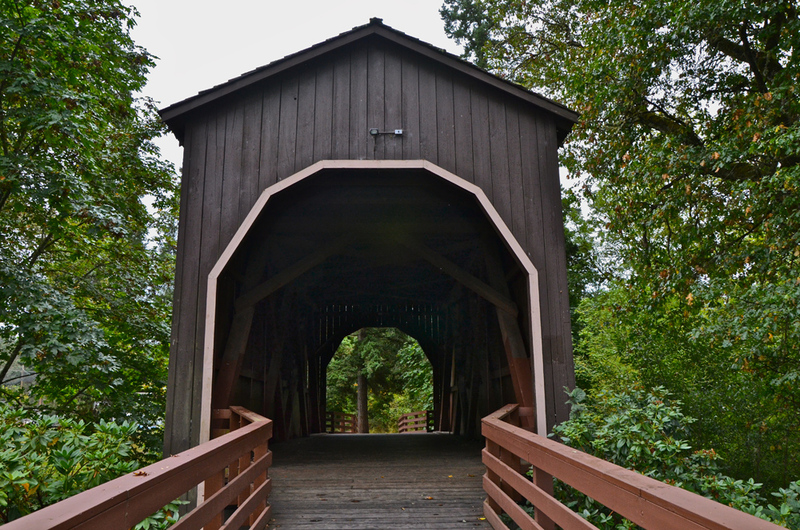 Although I have shot many covered bridges in the past (see gallery), all of them were – and presumably still are – in New England. I even managed to find online a map pinpointing their respective locations and offering brief descriptions. From the website of the Covered Bridges of Oregon Society (there actually is one) I learned that most were built between 1915 and 1925 and that at one time there were some 450 within the state. For one reason or another – fires, floods, structural degradation – the number has dwindled to 50. Even so, that’s quite a few – probably more than remain in any individual northeastern state. En route back to I-5 and from there westward to the coast, a two-hour drive from Medford on mostly country roads, we stumbled upon our first Rustic Relic artifact, a circa 1950, California-plated Hudson sedan, which hadn’t been in mint condition in some time. It sat in pitiable repose in a ravine under an overpass. Because access required going onto private property – a nondescript auto body shop – I obliged Pat’s standing albeit sometimes ignored request to ask permission. Dutifully, I parked the car and strode to the front door. A few knocks later, a man appeared. That I had permission to shoot pleased Pat and me both. Having observed that I was given a free pass, Pat nodded, then returned to her preferred kill-time reading matter, the New York Times. Although the sky was leaden in color, at least it wasn’t raining and for this I was grateful. So was my non-waterproof Nikon. 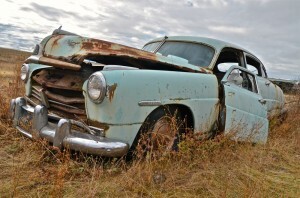 When I got back home and viewed the images on my monitor, it occurred to me that the somber sky seemed a fitting backdrop, as Hudson Motor Company went out of business in 1954 (following a corporate merger of Hudson and Nash, the Hudson name was retained for three additional model years). Once finished with the Hudson, we retraced our way back onto the Interstate. From there, we wended our way west, through intermittent rain, ultimately to Florence, situated roughly mid-coast. Preciouslittle to write home about regarding the city, although it does have an attractive historic district. We grabbed a bite and I, of course, grabbed not one but a pair of my “vice” drinks, the cappuccino, both at independent coffee houses. The first was marginal, the second quite good. One for two ain’t bad. As we motored up Highway 1, windshield wipers flicking to and fro, we wondered aloud why so many coastal towns are so certifiably tacky. Same reason most towns, coastal or otherwise, are tacky: lax (or no) zoning control. My son, Andrew, maintains that one true measure of a given town’s tackiness index is what kind of storefront signage is permitted. If no backlit signs are to be found, it’s two (maybe three) thumbs up, he maintains. Few towns I know of qualify. One is Breckenridge, the well-known ski-resort town in Colorado. Another is Santa Barbara, California. A third is Ashland, in southern Oregon, where two days hence we overnighted after taking in a play. 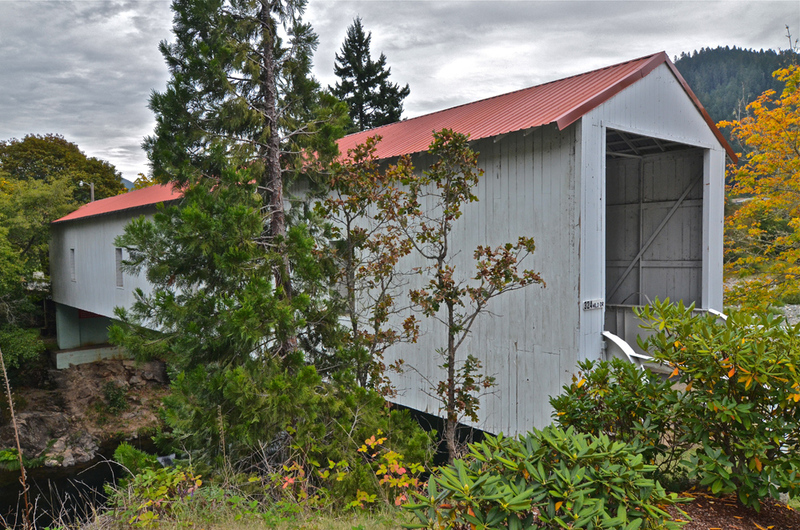 Aided by cellphone GPS reckoning, on tortuous back-road leg between Florence and Salem, we encountered not one, not two, not three, but four covered bridges. The only one not painted white was in the backwater burgh of Drain (I kid you not), population 1,151 and heading down the … you guessed it. The Drain example – officially Pass Creek Bridge, is located between the civic center/library (actually quite nice) and the town’s one-and-only high school. Originally built in 1906 and measuring 61 feet long, it was closed to vehicular traffic in 1981. Also pictured here – bestriding Myrtle Creek – was the prettiest of those we visited up close and personal. Built in 1939 and like most others, is framed in wood. As I was taking photos, a neighbor buttonholed me and recited in intimate detail the history of the bridge, far more than I cared to learn. 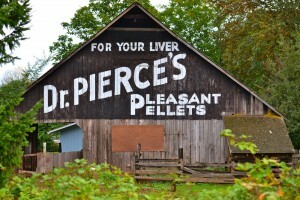 In addition, not more than a half-hour or so past Myrtle Creek we serendipitously encountered an old barn in Cottage Grove. We went there looking for a historic bridge, which we did find, but because it was rebuilt just a few years earlier, I decided it didn’t merit the designation of “historic.” So I passed on it. The barn, shown here, was far more intriguing and far more photogenic. After taking the photo, tight by I-5, I learned from a local that it was slated for demolition and that, as a result, a grassroots campaign was under way in hopes of staving off the wrecker’s ball. At the end of this 130-mile leg of the trip we stayed at a nearly empty Hampton Inn in downtown Salem, the state capital, which we had visited once before. Nice town. Clean and green … and, it would appear, at least a semblance of zoning control. En route to Ashland we stopped in Eugene, home to University of Oregon. The school’s choice of a mascot, the duck, is highly appropriate, as there is no shortage of rain. True throughout much of Oregon, particularly the western half. While in Eugene we stopped at a Verizon store where a kindly sales clerk took pity on me and, in a veritable trice, fixed my contrary HTC Incredible smartphone, which had gone mysteriously haywire that morning. “Operator error,” as fate would have it. No surprise to this card-carrying Luddite. 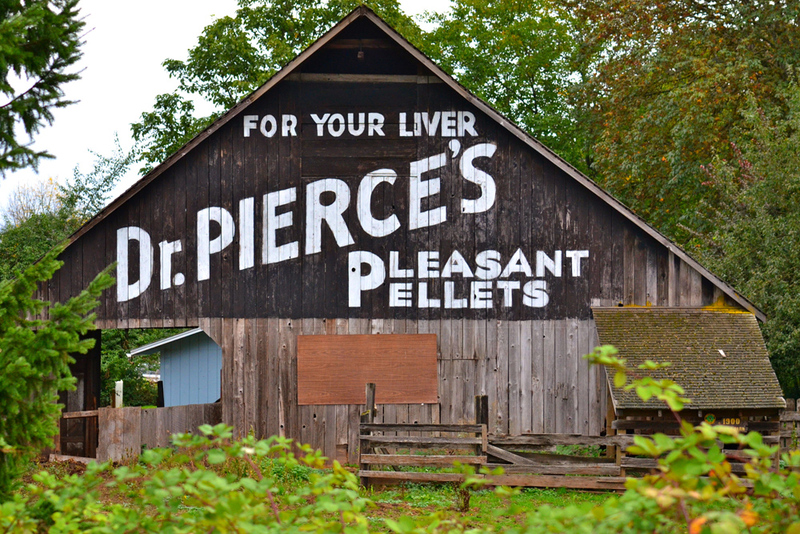 Preferring to take an alternate route that allowed us to bypass a long stretch on I-5 that we had traversed traveling north, at Roseburg (huge lumber mill) we willingly subjected ourselves to more hinterlands byways, which eventually reacquainted us with the Interstate at – yuk! — Medford. 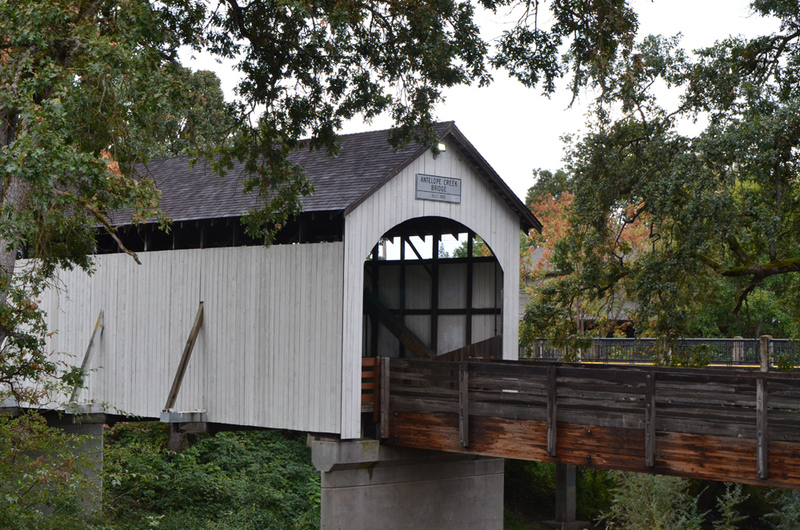 The first photo op was the fifth and final covered bridge we visited. Like all but one of the others preserved to memory card and unlike the others, it sits on private property – the campus of a Seventh-Day Adventist boarding school. An additional boast of Milo Bridge, opened in 1962, is that it’s the only covered bridge in Oregon constructed of steel and sheathed in wood. 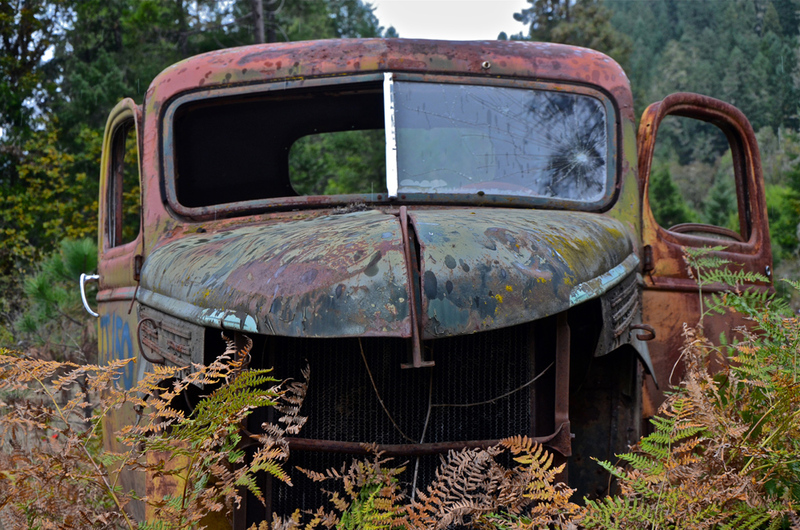 Not much farther down Highway 227 we chanced upon a serendipitous photo op – a discarded, earnestly rusted 1940s Chevrolet one-ton truck. 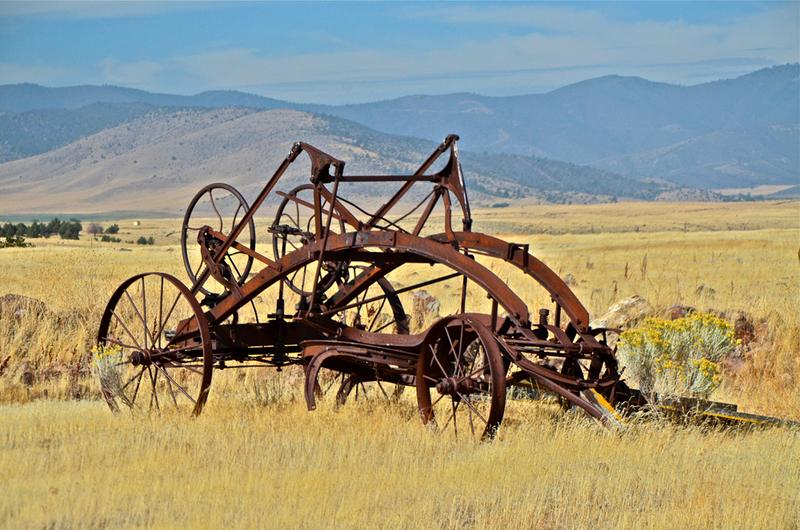 Within spitting distance of it were three other decrepit vehicles — a motorhome, a sad-looking 1980s Ford Thunderbird and a prehistoric tractor of unidentifiable make. Plans for the evening secured, we walked through the business district. A very charming town, one reason being, you guessed it, NO BACKLIGHTING! It’s one of the nicest little (pop. 20,000) towns I have visited. Cute shops – many of them upscale – no chain stores save for the inevitable Starbucks. And, believe it or not, an independent bookstore with a lovely independent café upstairs in the loft. Wow! My kind of town. Not surprisingly, given that it’s home to the Shakespeare Festival, it’s an artists’ community. It’s also home to Southern Oregon State University. Before the play we dined at a little trattoria named Pasta Piatti. The food was terrific and the portions were humongous. Both of us had enough left over for a next-day meal back home. Ah, yes, the play’s the thing. The performance we saw, one of the last before they closed for the winter, featured a woman in the lead role. A worthy performance she delivered, but I must say – and at the risk of sounding sexist – that it taxes one’s credulity to see a 5’1”, 110-pound female cast as Julius Caesar. In a word, unconvincing. So much so that Pat and I did the unpardonable – we slipped out at intermission and did not return. Well, we were tired anyway from a long day on the road. Following a “complimentary” breakfast at the Inn, we saddled up again, this time for the final leg back. At the recommendation of a bookstore clerk, before heading out we took a walk through the fabulous, 93-acre city park, designed by the same man who laid out Golden Gate Park in San Francisco. If the presence of the Shakespeare festival, the Bathroom Readers Institute and Brammo weren’t enough – not to mention the absence of backlit signs — surely gaining acquaintance with this park ought to put the town of Ashland on any sane person’s short list of to-die-for places in which to live. It’s definitely on mine, and I do plan to return visit. Just south of town, off the Interstate, is the Mount Ashland ski area, probably not on any elite skier’s short list of must-visit venues to downhill — peak elevation only 7,500 feet and not a whole lot of snow. Moreover, the vertical descent, a key factor, is only 1,165 feet. 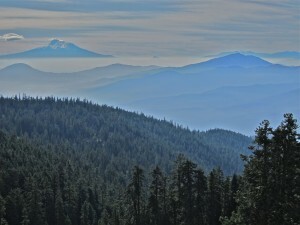 By comparison, Mount Bachelor, Oregon’s highest peak, stands 9,065 feet tall and offers a drop of a – yikes! – 2,645 feet. Nevertheless, to give its due, Mount Ashland is eyeball-spinning beautiful. We drove to just below the summit. I got out and squeezed off several late-morning vista photos, one of which appears here. Anyone who has driven I-5 knows there isn’t a whole lot of jaw-slackening scenery – not unlike driving on I-80 through, say, Kansas or Nebraska – so I wasn’t expecting to find any come-hither photo ops, particularly since I had done a behind-the-wheel, real-time survey on the way up. With this in mind, we took a back road, which proved fruitful. Pat requested a pit-stop timeout. 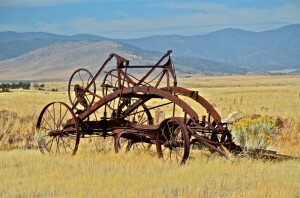 While she was in the ladies room, I took a picture of an old farm implement (thus qualifying as a genuine Rustic Relic) sitting behind a menacing barbed-wire fence in a field next to the rest area. Although I have no idea exactly what it is, my eye was drawn to it nevertheless, mainly as a piece of stark, muscular, look-at-me metal sculpture. The backdrop of mountains made it the more pictorially fetching. A few hours hence we were back in Lafayette where we have hung our respective hats for nigh onto 13 years. Over a stretch of five days we hadtraversed nearly 1,800 miles. Granted, hardly a Guinness record, but given the abundance of foul weather, it seemed like more. Still and all, it proved an enjoyable excursion, the more so for me because I did return with a prized passel of keeper images. Those shown here are a fraction of the total harvest.